Better late than never….Recipes from Kasi Kitchen! I was delighted to meet the Kasi Kitchen team at the Good Food and Wine show late last year. Cinderella is a delight…easy to work with and blessed with a great sense of humour! I just love her enthusiasm and see just loves her curries! After tasting my best party trick, The Emergency Chicken Curry, she did not waste any time in setting up a shoot day to feature some of my recipes on her show. After a rocky start to the day with the make up artist bailing on us at the last moment, we got going a little later than expected. I have not seen the show yet but hoping that I did a good job with the hair and make-up. I must confess that this was the first and a bit like being dumped in the deep end since I am a lip gloss and mascara only kind of person! hmmmm…fingers crossed on the make up! Before we get to the recipes, I must apologise for not posting this sooner! Better late than never is what I always say….my facebook page lit up two days ago after the show was re-broadcasted with requests for recipes….without further delays…here are the star recipes from the show! 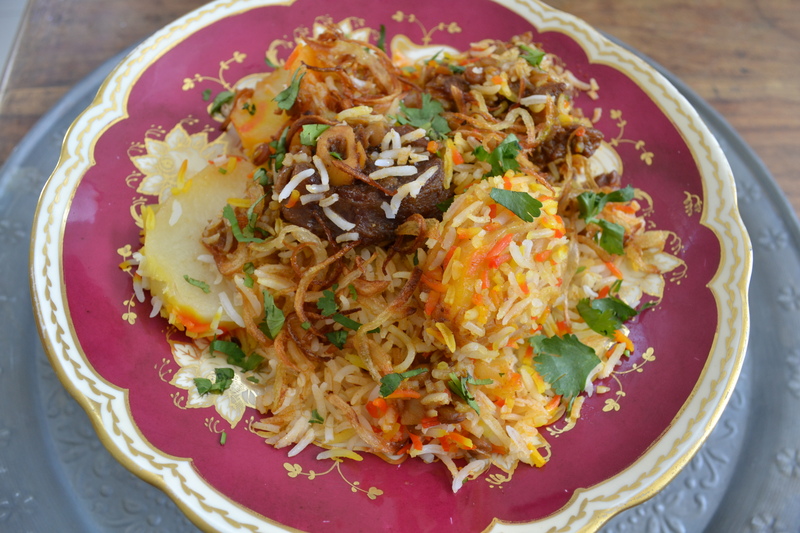 And here it is ….my favourite favourite…Lamb Breyani! Peel the potatoes and slice them into thick rounds. Heat the sunflower oil in a pan and fry the potatoes until tender. Remove from the oil and leave to drain. Gently dab the excess oil with absorbent paper towel. Fry the onion slices until light golden brown. Remove the onion from the oil and leave in a colander to drain. Spread the onion slices over absorbent paper towel. Heat 60ml sunflower oil in a large thick bottomed pot. Fry the cinnamon stick and bay leaves until fragrant. Add the cardamom pods and cumin seeds. When the cumin seeds start to sizzle, add the onion and salt. Stir for a few seconds and then add the red chilli powder. Stir well and add the lamb knuckles. Mix the knuckles in the chilli paste and continue stirring until the meat begins to stick. Lower the hear and scrape the bottom of the pot with a wooden spoon. When the spices on the bottom of the pot start to brown, pour in boiling water to cover the knuckles. Simmer the knuckles on a low heat, adding more water if necessary. When the knuckles are tender and the sauce has reduced, layer the fried potatoes over the lamb. Pour in the fresh cream over and then layer half the lentils over the potatoes. Layer the cooked basmati rice over the lentils and scatter the remaining lentils on top. Dot the rice with chopped pieces of butter and sprinkle the Magic Masala over. Pour the boiling water into the pot and pour a few drops of egg yellow food colouring over the rice. Sprinkle the fried onion slices over the rice and cover the pot with a tight-fitting lid. Simmer the breyani on the lowest heat setting until the rice has steamed through. Gently toss the breyani and garnish with fresh coriander. Always use cold rice when making breyani as this prevents the rice from getting sticky. The rice should be par boiled and seasoned in this recipe. The potatoes can be par-cooked by boiling. Chicken pieces can be used instead of lamb in this recipe. I prefer using fresh cream but low fat yoghurt can be used instead. Adjust the red chilli powder if you would like to make this dish milder or hotter. Curry Me Home spices are available at select SuperSpars. 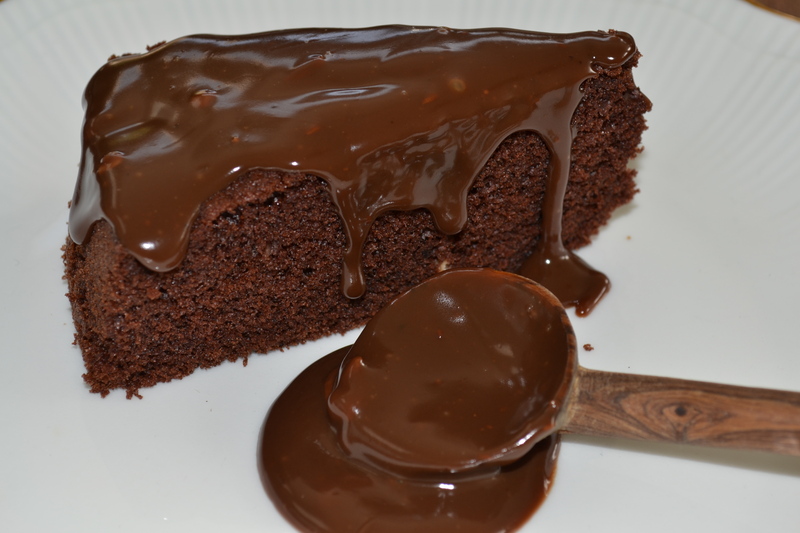 And for the Chocolate Ganache Cake…. In a large mixing bowl, beat the eggs with a hand-held beater. Turn out the cake onto a wire rack. Heat the apricot jam with water. Glaze the cake with the hot jam. Pour the chocolate over the cake and serve immediately. Make sure the mixing bowl is oil free before whisking the eggs. Oil prevents the eggs from incorporating air. Slice the cake before pouring the chocolate sauce over as this makes it easier to serve. This cake can be stored in an airtight container for 3 days. You can also serve this cake with whipped cream and fresh berries.